NFL in LA: What’s taking so Long? It’s the second largest media market in the US. It’s the city of glitz, glamour, and infinite opportunities. It’s the entertainment capital of the world. Yet, it fails to keep an NFL team. What seems to be the problem in Los Angeles? 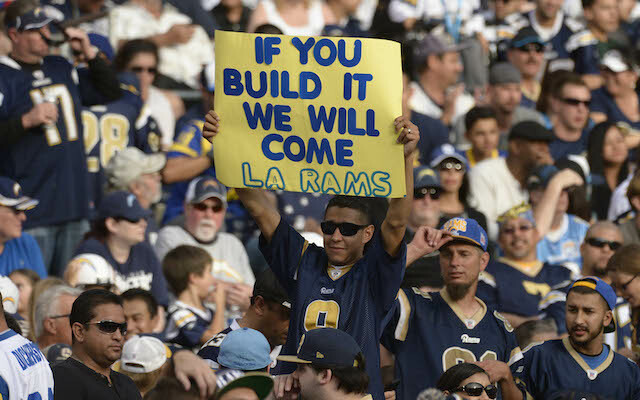 No NFL team has called Los Angeles home since 1995, when the Rams played at the LA Coliseum. That’s a 20 year gap since an NFL team has snapped a football on LA turf. To put things in perspective, a digitally added yellow first down line hadn’t even existed the last time LA had a football team. While there has been lots of recent speculations and proposals about having a team (or two) in LA, realistically when is it going to happen. One of the biggest problems, I believe, LA faces is being able to have the fan loyalty and support of the team(s). As we all know, LA has an extremely fickle fanbase that is quick to lose interest if the team is not performing well. Just ask Laker Nation. LA residents are simply spoiled when it comes to storied franchises that have built their legacies in LA. In addition, there are many other distractions and amusements going on 365 days a year in LA, that could be a detriment to accumulating fan commitment. There’s a specific reason why the Green Bay Packers tickets are sold out for the next few decades, and its not just because they’re a good team. The bottomline is that the only way to guarantee fan loyalty in LA, is to win. Plain and simple. The main, and most legitimate, proposition for an NFL team in LA has been for a two team deal to come to Los Angeles. Both the Chargers and Raiders have announced plans to move into a $1.7 billion stadium in Carson, CA. This is quite an intriguing proposition for both teams. While passionate fans of both franchises have voiced their disgust behind the potential move and merge, the NFL cannot veto an owner from moving a team. Not to mention, the Rams have also threw their name in the LA sweepstakes hat, as they intend to propose a $1.86 billion stadium in Inglewood. It appears as if some cat fights will be inevitable as LA figures out these proposed moves. At this time it’s not a matter of if, but when. After all, it only makes sense that the #2 market in the nation is home to a team of the #1 sport in the nation.